Yext offers unique solutions for different industries. It has specialized tools for food services, car dealers, financial services, hotels, hospitals, small businesses, retail stores, and even government institutions. Its features work hand in hand with companies’ marketing goals. In addition, it offers a centralized portal that allows businesses to directly solve customer concerns, bad reviews, and brand inconsistencies. Yext gives its users the ability to fully control and develop their digital presence with advanced SEO tools and real-time reports and analytics. Yext has been named the Best Place to Work by Fortune and Great Place to Work® as well as a Best Workplace for Women. Yext is headquartered in New York City with offices in Berlin, Chicago, Dallas, Geneva, London, Paris, San Francisco, Shanghai, Tokyo, and the Washington, D.C. Area. The Yext Knowledge Engine™ helps companies of all sizes centralize, manage, and update digital knowledge about their people, places, and products— from holiday hours and staff specialties to parking entrance and in-store promotions — across their websites, mobile apps, internal systems, and a leading network of more than 100 maps, apps, search engines, GPS systems, and social networks including Google, Apple Maps, Facebook, Microsoft Bing, and Yahoo. Knowledge Manager is the platform’s primary tool for managing all information that customers search for regarding brands, offerings, locations, and people related to a business. This covers information about products and services, marketing programs, and other business activities that can drive sales. With Yext’s best-in-class, cloud-based platform businesses can harness the power of knowledge to drive internal efficiencies, great brand experiences, and rich customer interactions everywhere online. Yext Pages helps businesses provide consumers with a contextual experience that makes the path to purchase easy, as well as the markup that search engines look for to provide rich experiences such as events, locations, and reviews to their users. Yext Listings puts businesses in control of the facts about them across 100+ digital services globally. Yext’s direct integrations put businesses in definitive control of how their listings appear across a leading network of more than 100 maps, apps, search engines, GPS systems, and social networks including Google, Apple Maps, Facebook, Microsoft Bing, and Yahoo. Yext Reviews helps businesses generate authentic, first-party reviews directly from customers, which can help them stand out in today’s new search experiences. And businesses can monitor and respond to reviews across the web, uncovering new opportunities to improve operations and win more business. With Yext Analytics, businesses can concentrate on every customer interaction, wherever, whenever it happens. It is primarily designed to capture how a business performs across all customer contact channels. Aside from determining how a business ranks in online search, Yext also measures customers perception of how well you actually manage your brands and services. What Problems Will Yext Solve? Nothing is more frustrating when a business encounters spam or malicious bad reviews. Branding is affected and such information becomes a part of the business’ digital identity. Yext offers a solution to this problem with its Review Monitoring tool that monitors all of your business’ ratings and review. Through this, you can rest assured that you will be notified of all ratings and reviews on all listings involving your brand. In case of bad reviews, the tool allows you to reply, air your side, and clear your brand’s reputation. Most of the time, businesses don’t pop up in search results not for the lack of presence in listings but due to double listings in one directory. This is confusing and effectively weakens a brand’s overall digital presence. Yext has tools that solve this dilemma. Its patented Duplicate Listing Suppression tool has an automatic detection mechanism that scans all your listings and helps you in eliminating the inactive and unofficial entries. In addition, it has a tool that monitors on the daily whenever a duplicate listing is made. More than half of customers now use voice search apps like Alexa, Siri, and Google Assistant to avail services and goods. If your brand is not maximizing this platform, you’re missing on 58% of your leads. Yext solves this gap by providing robust tools to make your business listings compatible with voice search optimization. 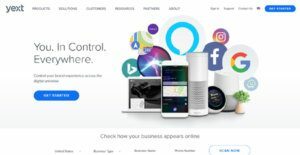 This way, your business and its particulars —- location, open hours, products, and services — will be optimized for voice searches. It is crucial to realize that hardly any app in the Marketing Software category is going to be an ideal solution that can fulfill all the needs of various business types, sizes and industries. It may be a good idea to read a few Yext reviews first as specific services might dominate exclusively in a very small group of applications or be designed with a very specific industry in mind. Others might work with an intention of being easy and intuitive and as a result lack complicated features needed by more experienced users. You can also find apps that support a large group of users and provide a complex feature base, however that frequently comes at a more expensive price of such a solution. Be certain that you're aware of your needs so that you purchase a software that offers all the functionalities you search for. How Much Does Yext Cost? We realize that when you make a decision to buy Marketing Software it’s important not only to see how experts evaluate it in their reviews, but also to find out if the real people and companies that buy it are actually satisfied with the product. That’s why we’ve created our behavior-based Customer Satisfaction Algorithm™ that gathers customer reviews, comments and Yext reviews across a wide range of social media sites. The data is then presented in an easy to digest form showing how many people had positive and negative experience with Yext. With that information at hand you should be equipped to make an informed buying decision that you won’t regret. What are Yext pricing details? What integrations are available for Yext?